The rear legs of this table swing back to support a top that opens up to a 31" square. The top is inlaid with tulip wood and satinwood crossbanding, and the finely tapered square legs have ebony stringing. 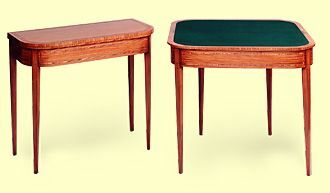 Open, the table is finished in satinwood and crossbanded, and the card table has a baize top with tooled edging and satinwood crossbanding.